We specialise in the valuation and sale of Stuart Devlin silver and have a wide network of clients looking to buy pieces from private collections. The sad passing of Devlin in 2018 has meant that prices for his work have increased in some cases, especially for larger pieces such as candelabra and centrepieces. We can advise the value of your Stuart Devlin silver and help you find the best place to sell it, taking care of all the administration and logistics too. So if you have a piece of Devlin silver and you would like a valuation please contact us for more information. Stuart Devlin began developing his own style while releasing limited editions of Christmas boxes and Easter eggs crafted with many forms and textures. New collections were released annually and showcased in his gallery on Conduit Street in the late 1970s and early 1980s. In his prime he adapted new techniques and experimented with different textures. In 1982, Her Majesty the Queen granted Stuart Devlin the Royal Warrant of Appointment as Goldsmith and Jeweller. He served as Prime Warden from 1996 to 1997 of the Goldsmith’s Company and worked to help establish careers of upcoming goldsmiths and jewellers. He is also known for his interior design, furniture design, and jewellery. Many commissioned pieces exist in various forms like bowls, goblets, clocks, trophies, and centrepieces. He is renowned as a coin designer, having made coins and medals for 36 different countries. His designs were used in coins for the 2000 Olympic Games and for Australian national medals. His London workshop is now closed, and he is unable to draw after suffering from a stroke in 2014. He is celebrated as one of the most revered and talented goldsmiths and silversmiths in the world. 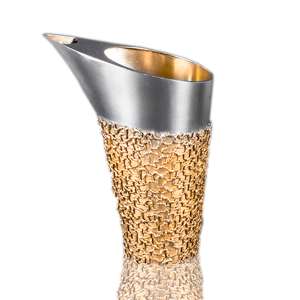 The torch for the London 2012 Olympic Games was crafted as a tribute to his influence on British design. What affects the value of Stuart Devlin silver? Very few pieces of Stuart Devlin jewellery ever come to the market. As a result they are always sought after and can command high prices. Marketing Stuart Devlin jewellery is not something every auction house is capable of (despite what they say) so selecting the right saleroom is key. 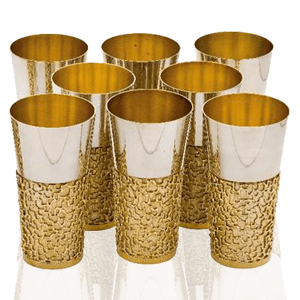 By far the most common Stuart Devlin pieces to come to market are drinking vessels. 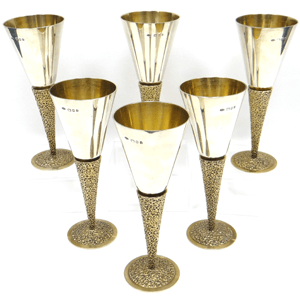 Champagne flutes, goblets, wine cups and many others are all widely known of. Although not really collectable, there is a good market for them as pieces of practical modern design. 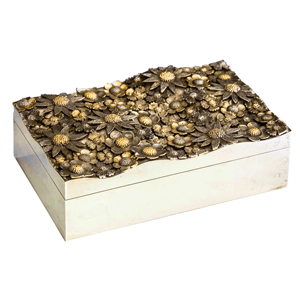 Items that can sit on a desk, such as boxes, inkwells, and novelty forms, are highly sought after. Boxes in particular are very commercial. As the covers of boxes are often flat, they can be susceptible to collecting a lot of dust and you need to be careful not to use and strong detergents to clean them (compressed air is best). By far the most commercial pieces of Stuart Devlin silver are centrepieces and candelabra. These can often be monumental in scale, holding dozens of candles. As many were commissions they rarely come to market as they are often with the original owner who do not want to part with them. When they do appear for sale they can sell for tens of thousands. 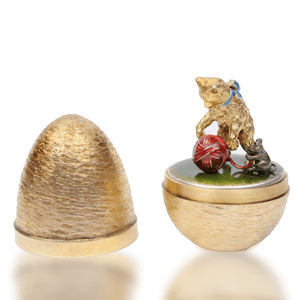 The range of Stuart Devlin Christmas boxes and Easter eggs are very collectable. Although mostly worth hundreds, not thousands, this actually works in their favour as they are the ‘entry point’ to Devlin silver for lots of collectors. To get the best price they must retain their original outer box and be in very good condition. Most pieces of Stuart Devlin silver have a gilded element on them. This must be in perfect condition and without any signs of rubbing or wear. The main reason for this is that the gilding is very expensive to restore, often require the entire piece to be disassembled and totally re-gilded. If you would like a free, no obligation valuation of your Stuart Devlin silver please use the form below. 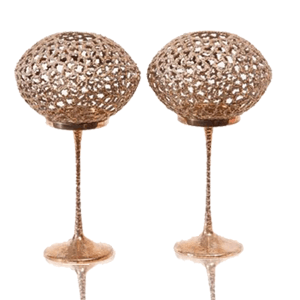 Stuart Devlin is a world-renowned goldsmith and silversmith. Born in Australia in 1931, he established his reputation as a London designer primarily from the 1960s through the 1980s. 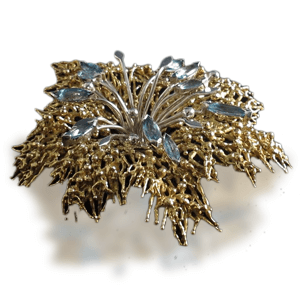 He started his career as an Australian art teacher who specialized in gold and silver work. In 1958, he studied at the Royal College of Art in London, and he also studied at Columbia University during a two-year fellowship in the United States. He won a prestigious competition to design coins for the Australian government in 1964, which gained him fame and success. He opened a London workshop in 1965.